For our in-depth monthly series on all things Austin and events-related, we recently sat down with Raum Industries co-founders Ken Dineen and Travis Cook to talk about art installations, Austin’s creative community and collaborating with Ai Weiwei. Read on for a glimpse into how they make the magic happen everywhere from corporate events to art competitions. KENNEDY CREATIVE EVENTS: What is Raum Industries, in a nutshell, and how did it come into being? KEN DINEEN,CO-FOUNDER, RAUM INDUSTRIES: Travis Cook and I went to grad school together at UT for architecture, and we’ve always been interested in installation art and material exploration, and we kind of started through a competition at South By Southwest two years ago, so the infinity panels (we installed today) were from a stage backdrop competition during South By. So that was kind of our first project together, and from there we’ve been doing installations for corporate events and art festivals and things like that. We did another art competition last year for SXSW’s inaugural art program. KENNEDY: So, what’s your split, in terms of your time, between corporate events and art more just for the sake of art? Is it kind of 50/50, or does it shift? DINEEN: It’s probably half and half. KENNEDY: Tell us a little about what you’re doing today. You’ve got three installations in progress at one corporate event: two indoors onstage and overhead, and one outside in a tent. 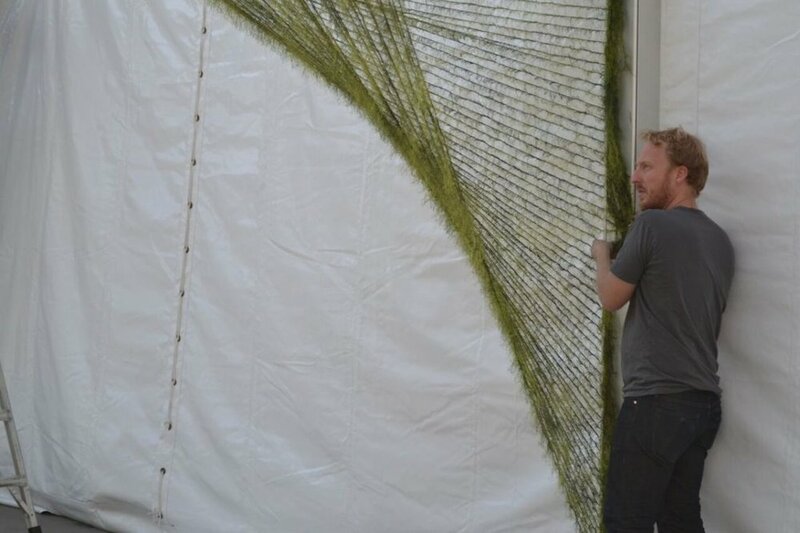 DINEEN: This client came to us with a little more of a prescriptive idea, as in “We want to divide the space, we want to do an installation in a tent…” and we’d pitched a string art installation to them previously, and they talked about re-imagining that for the tent. So, it was “String art piece in the tent and then go from there.” So we came and measured the tent, modeled it, and came up with these two pieces to delineate the space — the lounge, the bar. These string art pieces are nothing new — other people have done them — but we wanted to take a different approach with the materials and do something a little fuzzier and more playful, a little weird. Kind of riffing off the plant theme, kind of swampy and viney. KENNEDY: What’s the creative process like when it comes to conversations with your clients? Do you come to them with the main idea and they refine it, or is it in reverse, or something else? KENNEDY: How do you find your clients? 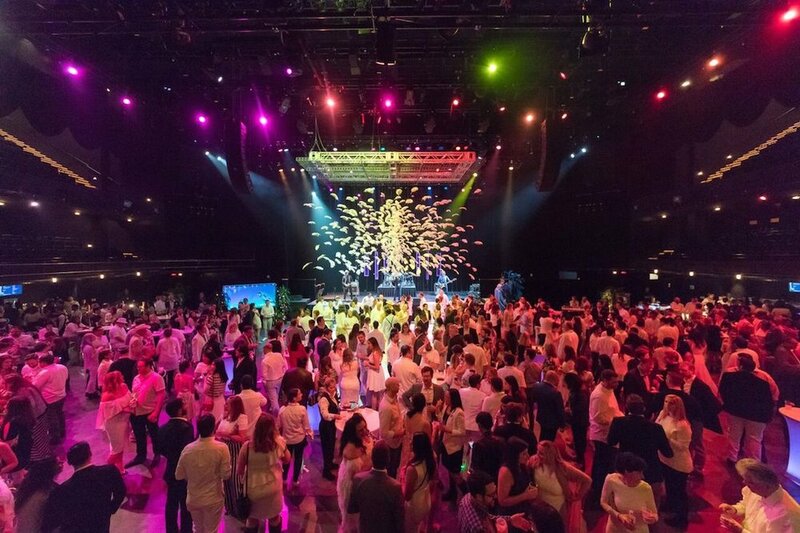 Is it through event producers like Kennedy, more direct, or a mix of both? DINEEN: It’s a mix. We just did a large art installation in Montana for an art festival through friends of ours here in Austin who had a connection. We’ve done some competitions, like the one at SXSW, and we’ve reached out to brands directly, and worked through event producers. KENNEDY: Who’s your ultimate dream client? Or, alternatively, your ultimate dream installation — something you’d die to be able to create for someone? TRAVIS COOK, RAUM INDUSTRIES CO-FOUNDER: I think… Elon Musk, or someone like that who has interesting technology and asks us, “What can you do with it? What can you create with this technology?” I think that’s what we’d really love to get into. We’ve had a conversation with a tech company before, with their head of R&D, and that’s what was imagining… a collaboration like that: “OK, we have these new products. How would you use them? How would you imagine utilizing them in an artistic way?” I think that would be a dream client. KENNEDY: Are there other artists around town whom you collaborate with, or are you completely on your own? DINEEN: We collaborate with different artists, and we’re kind of founded on that. If there’s something outside our wheelhouse, we have a network of people. Whether we’re working with fabrics and it’s a seamstress or we’re doing something more digital and we need a programmer — we have some programmers we work with — or lighting consultants, with the LED we can get so far and then we’ll partner with (people who specialize in that). We did a project for South By this past year, and there was a group of three or four of us who collaborated with Zane Baerenrodt — he works for The Contemporary, does art installations a lot for UT and Austin Art Services — he helped with the Ai Weiwei scultpure in town — so we brought him on to help with the install. We collaborate as much as possible. KENNEDY: What would you say to a prospective client who has budget concerns, sustainability concerns, or anything that might be a hindrance to them saying yes to working with you? DINEEN: I think that’s just another design challenge for us. I think being up-front about that from the beginning is best for us — it’s just another challenge. We try to reuse everything. I don’t think we ever create anything and just throw it away at the end. KENNEDY: You mentioned the infinity panels have been reincarnated, so to speak. DINEEN: Yeah, we’ve used those multiple times. And we’ll pack up a piece and try to use it again in another way. I think just being honest and transparent about things like that from the beginning (is key). We have a storage unit full of cool art pieces. To tap into that storage closet, talk creative possibilities and produce an extraordinary themed event, get in touch with the Kennedy team and put us to work.